In the year 2000, I went a little nuts. I basically had a kind of breakdown, where I could no longer handle the corporate IT job I had. You know that thing where you stare at a word for too long and it ceases to have any meaning? Everything around me was like that. So I quit my job, gave away most of my stuff, bought a backpack and headed south. I ended up in Christchurch. That was where a friend lent me The Illuminatus! 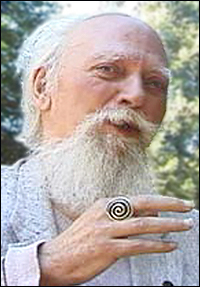 Trilogy, by Robert Anton Wilson (and Robert Shea). This was back when I was a Christian, before I had any idea what anarchism was about, etc. The ideas in the book, and the way they were conveyed, had a significant impact on me. Anyway, he’s dead now. It’s been a long time coming. ← The Sky is Falling! Buy My Books! Like a tired child home from a very wild circus . . .
(btw, if you haven’t read The Widow’s Son, do, it’s a good laugh).